Belkyra is a fat removal injection therapy targeting submental fat in a manner that is less invasive and requires less downtime than surgical procedures. Once treated, the effects are permanent, as the fat cells underneath the chin are removed and can no longer store or accumulate fat. According to a survey conducted by the American Society for Dermatologic Surgery in 2015, 67% of people are bothered by the fat underneath their chin. What is Belkyra formulated to do? Submental fat may be a concern for many patients and is sometimes cannot be improved by diet or exercise. Belkyra, also known as Kybella in the United States, is a treatment that has been proven to be successful in reducing submental fat, contouring the profile of the jawline. The active ingredient of Belkyra, deoxycholic acid, is a compound that physically disrupts cell membranes, resulting in their death. Deoxycholic acid naturally occurs in the human body as a bile acid, which functions to solubilize and emulsify dietary fats in the intestine. By using this product, localized and stubborn pockets of fat, such as submental fat, can be eliminated in a targeted and effective manner. 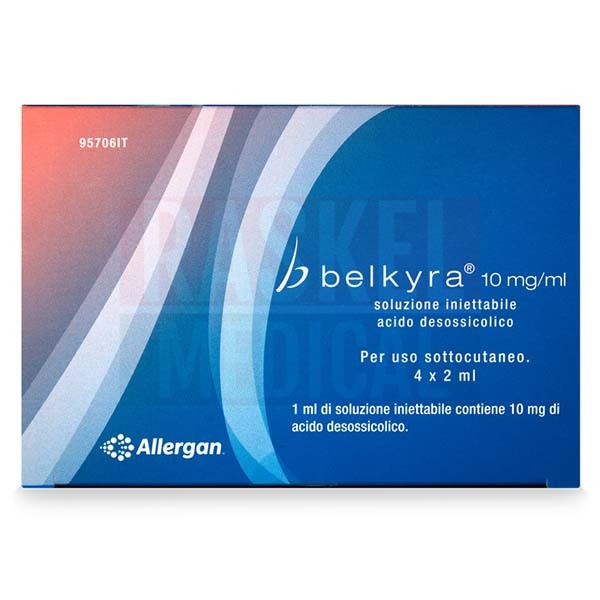 Belkyra is manufactured by Allergan, a global provider of aesthetic and pharmaceutical therapies and solutions. This product is manufactured in Europe. Common adverse events that are associated with this fat dissolving treatment include pain during the injection procedure, bruising, numbness, redness, itchiness, or a warm or burning sensation at the area of treatment. Other potential side effects that may occur include headaches, throat pain, nausea, or difficulty swallowing. 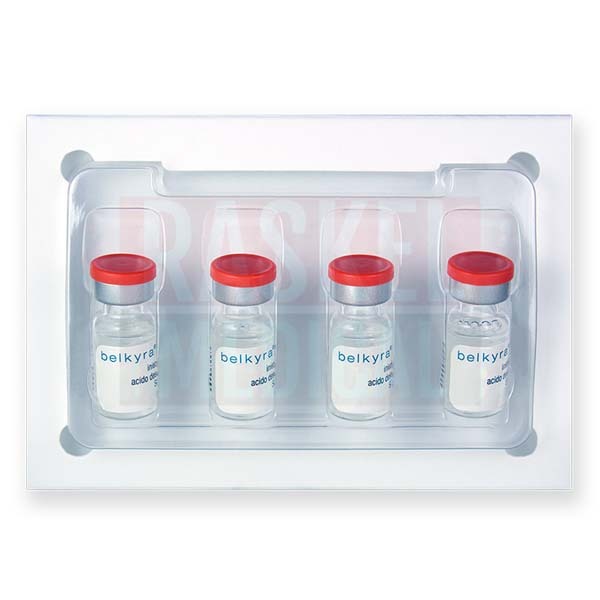 Belkyra is supplied in single-use clear, colorless glass vials. Kybella, as Belkyra is known in the United States, has received FDA approval. It is indicated for improving the appearance of moderate to severe submental fullness associated with submental fat in adults. The treatment is tailored to the individual, where the patient will receive multiple injections into the submental fat. The injection process takes around 15–20 minutes. Some patients may require multiple treatment sessions to achieve the desired profile. Each injection session should be given 1 month apart, and up to 6 treatments in total may be given. This chin fat removal injection should only be administrated by a qualified health-care professional with experience and knowledge in relevant submental anatomy and associated structures to prevent the occurrence of adverse events due to improper injection technique. Belkyra is administrated as a series of injections in a clearly defined area of treatment in the submental area that avoids vulnerable tissue structures and the marginal mandibular branch of the facial nerve. 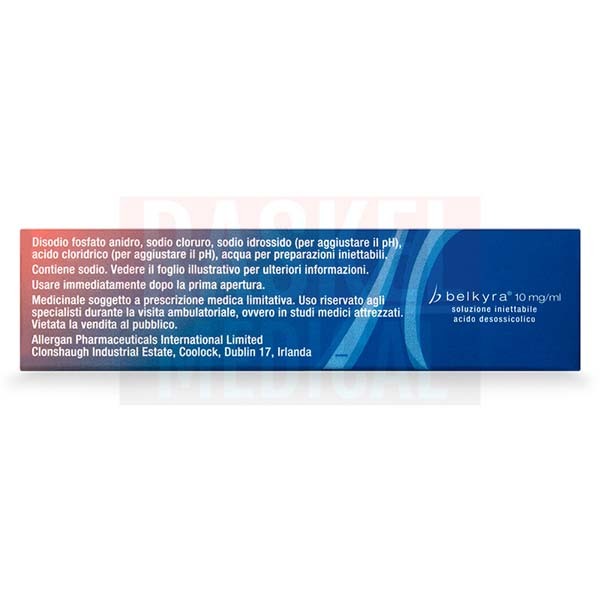 Cleanse and outline the treatment area with a surgical pen. Using a 30G needle or smaller, inject this treatment into the planned injection sites. Inject into the pre-platysmal subcutaneous fat layer. Do not inject into the post-platysmal fat layer. Inject 0.2ml of product into each site, 1cm apart, until all sites in the treatment area have been covered. Do not exceed the maximum dose of 100mg (10ml) in a single treatment. The number of injections needed will depend on the amount of fat under the chin and the desired results. It is not recommended to inject this solution if the treatment area is infection or if the patient is under the age of 18. Discuss any surgical procedures the patient has had or is planning to have on the face, chin, or neck area. As well, it is not known whether Belkyra can pass into the breast milk of breastfeeding mothers. 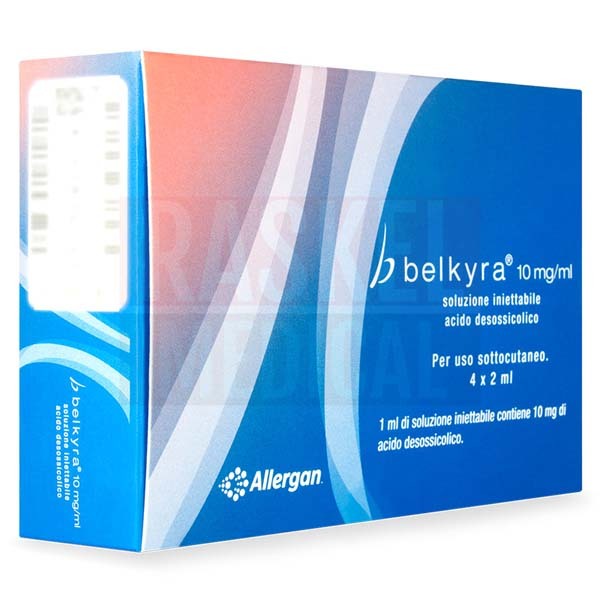 Belkyra is a clear, colorless, and sterile solution used for injection. The active ingredient is deoxycholic acid (10mg/ml). The other ingredients are water for injection, sodium chloride, sodium hydroxide, hydrochloric acid, and disodium phosphate anhydrous. Results of Belkyra are permanent as stubborn pockets of fat are eliminated in an irreversible manner. However, new fat cells may be created with weight gain. Patients are advised to maintain their weight to avoid new fat cells from forming. Keep out of sight and reach of children. Store at 20–25°C.